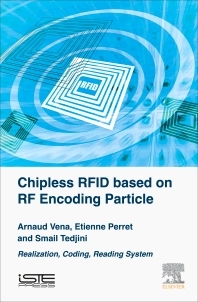 This book focuses on the development of chipless RFID tags, representing a new family of low cost tags. With this technology information is extracted from the electromagnetic response of the tag, which depends only on its geometry. Various solutions have been developed by the authors to increase the amount of information, reduce the surface of the tag, or improve the robustness of detection. Considerations such as realization using paper substrate, the development of a low cost detection system, and measurements in a real environment have been addressed for practical implementation. Arnaud Vena is a lecturer at the University of Montpellier. Following industrial experience of more than 4 years between 2005-2009 at ACS Solution France, in the design of RFID readers in HF band, Arnaud Vena completed a thesisat the laboratory-INP Grenoble LCIS in Valencia to study RFID without chip. Between 2012-2013, he made a postdoctoral stay at TUT University in Finland, where he continued his research in the field of RFID sensors made by inkjet printing. In 2013, he joined the IES lab at the University of Montpellier, to reinforce the theme "RFID sensor". The same year, he won the thesis prize from the University of Grenoble for his contribution on chipless RFID technologies. In 2014, Arnaud Vena was elected "Early Career Representative" of the commission D "Electronics and Photonics" of the International Scientific Radio Union (URSI). Vena Arnaud is author of over 50 scientific papers and 3 patents. Etienne Perret is an Associate Professor at the Grenoble Institute of Technology and a member of the Institut Universitaire de France. He conducts radiofrequency research on wireless communication systems, in particular RFID and chipless RFID. Smail Tedjini is a Research Professor at Grenoble-INP, specializing in applied electromagnetics with teachings systems, RF circuits and components. His research involves simulation and modeling of circuits and Wireless type of radiofrequency systems and applications for RFID and UWB. Other research activities have concerned the rapid optoelectronics, transmission and RF signal processing in the optical domain.